ITIL® (IT Infrastructure Library) is a framework of best practices for the delivery of services. ITIL aims to help service providers offer their services in a quality-driven and cost-effective way. ITIL®  was first developed at the end of the 1980's by the Central Computing and Telecommunications Agency (CCTA), a government agency in Great Britain. The reason for commissioning the CCTA was a lack of quality in the IT services procured by the British Government, so a method had to be found to achieve better quality and simultaneously decrease costs. The first version of ITIL quickly grew into a series of 30 publications that provided guidance for improved service delivery and support. Large government and non-government organizations started to adopt ITIL, but around the turn of the century it became clear that a revision of the 30-volume framework was needed to make ITIL more accessible to a broader audience. This led to the publication of ITIL V2, a condensed set of publications that was widely adopted. The third version of ITIL, known as ITIL V3, was published in 2007 and updated in 2011. The latest edition of ITIL, named ITIL 4, launched in February 2019. (To learn more about the different editions of ITIL, please see below). Ownership of the ITIL trademark, intellectual property and certification scheme has changed several times. Today, ITIL is owned by Axelos Limited in Great Britain. Over the years, ITIL has become the de-facto standard for IT service management (ITSM). IT managers have adopted the service- and customer-driven approach promoted in ITIL, and the ITIL terminology is widely understood and used. For professionals who wish to develop their IT service management skills, the official ITIL certification scheme offers different career paths, and hundreds of accredited institutions around the world offer training and examination services. ITIL is some 30 years old and has been updated from time to time, but other, newer service management frameworks and approaches have emerged. Some, like FitSM, aim to promote a more lightweight approach to service management. Others, like SIAM® and VeriSM™, have been quicker in recognizing emerging trends in service management and information technology, such as service integration, cloud technologies and Agile / DevOps. 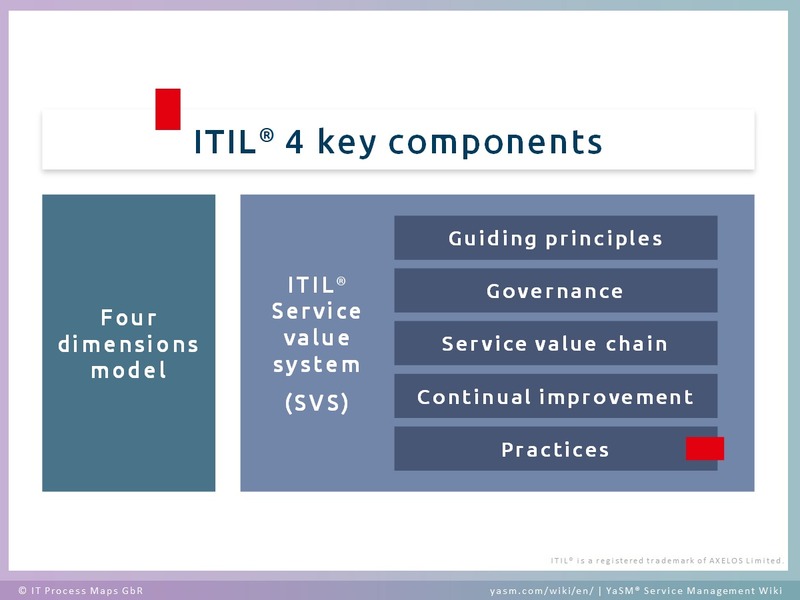 The latest edition of ITIL 4 has arguably taken a leaf or two out of these frameworks to keep up with the times, and the popular service management frameworks appear to converging towards similar ideas: They recommend adopting a systems approach to creating value for customers and other stakeholders. Operating models should be flexible enough to allow organizations to use any methods, practices and approaches that offer benefits. The systems approach is also in line with ISO 20000, the international standard for service management, where a key requirement is to establish a "management system to direct and control the service management activities of the organization". 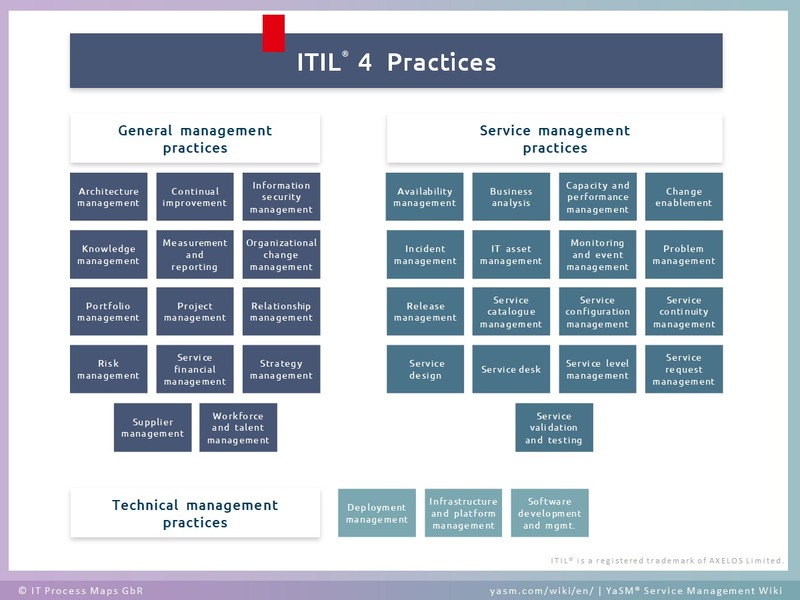 ITIL 4, the latest edition of the ITIL framework, was launched in February 2019. It is the first major update to ITIL since 2011, designed in large part to keep up with recent trends in software development and IT operations. ITIL 4 takes a more holistic approach than previous versions, focusing on "end-to-end service management from demand to value". Organizations can adapt the guidance as needed, to define flexible operating models that work in their specific situations. 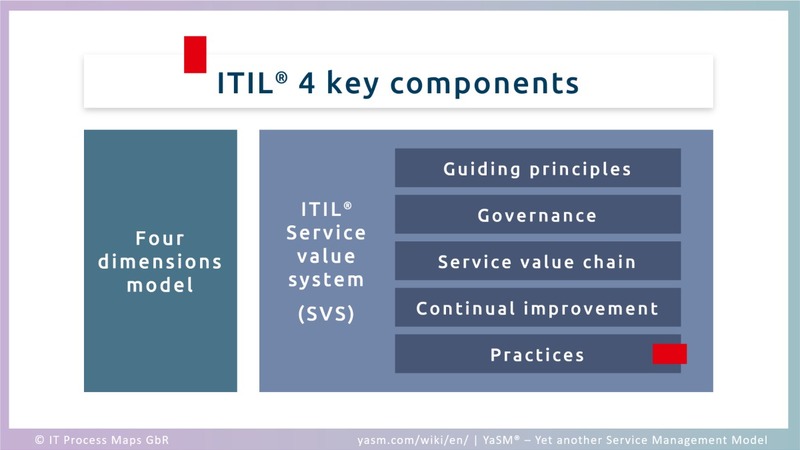 The ITIL service value system (SVS). For each value chain activity, ITIL 4 outlines the key inputs and outputs. The model for continual improvement describes a structured approach to identifying and implementing improvements that can be used at all levels of the organization. In 2007, OGC published a completely revised version of ITIL, known as "ITIL Version 3 (ITIL V3)". ITIL V3 reflects the experiences gained with earlier versions of ITIL and puts a greater emphasis on creating business value. A minor update to ITIL V3 was released in 2011 to correct errors and inconsistencies. The core guidance of ITIL V3 consists of five books, each describing a stage of the "ITIL service lifecycle": Service strategy, service design, service transition, service operation and continual service improvement. The key innovation in ITIL V3 is thus its adoption of the Deming cycle ("Plan-Do-Check-Act"), a well-known and generally accepted concept for continual improvement. Detailed descriptions of the ITIL V3 processes in the ITIL Wiki. ITIL V2 was released in 2000 and 2001, in an effort to make the first version of ITIL more accessible. What had grown into a vast 30-volume framework was condensed into a more coherent set of eight publications. Two of these publications, covering service delivery and service support, became very popular, while the six others mostly failed to reach a wider audience. Descriptions of the ITIL V2 processes in the ITIL Wiki. YaSM® helps organizations to get started with ITIL. It was designed to be well aligned with ITIL and everyone familiar with the framework will instantly recognize the common principles. Organizations that wish to adopt the guidance provided in ITIL will need to define ITIL-aligned processes. 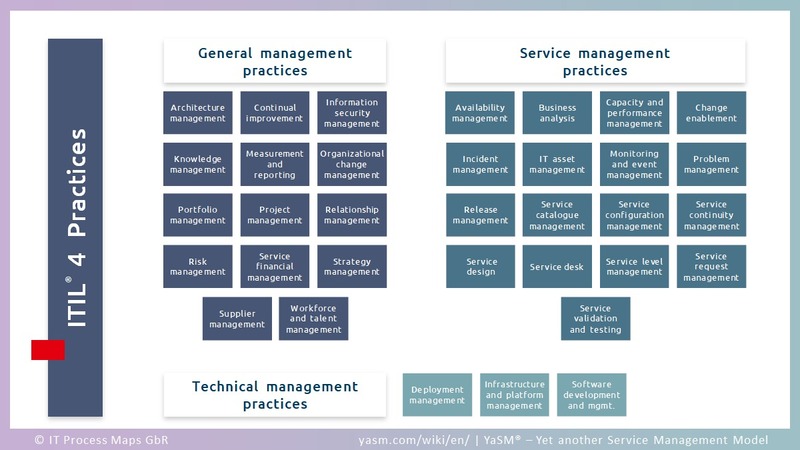 For this task, the YaSM model provides a complete set of process and document templates that can be adapted as required. How the ITIL framework compares with the YaSM process model. This page was last edited on 27 March 2019, at 20:01.